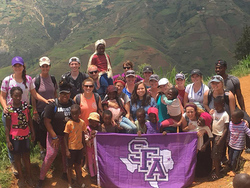 This past June, Stephen F. Austin State University students from six academic disciplines dedicated about two weeks of their summer break to accomplish a variety of projects in rural Haiti. Pictured, participating SFA students are joined by youth who reside in the mountain village of Quicroif. NACOGDOCHES, Texas - While many view summer break as a time to unwind and relax, others embrace it as an opportunity to immerse themselves in a new culture while working long hours to accomplish meaningful projects. This past June, Stephen F. Austin State University students from the academic disciplines of agriculture, early childhood education, environmental science, forestry, nursing and social work did just that - dedicating almost two weeks of their summer break to accomplish a variety of projects in rural Haiti. This year, Dr. Angela Jones, assistant professor of nursing within SFA's Richard and Lucille DeWitt School of Nursing, and Dr. Shelby Gull Laird, assistant professor of forestry within SFA's Arthur Temple College of Forestry and Agriculture, led a team of 13 SFA students who completed tasks ranging from human health and wellness to agricultural development in three rural villages. "The whole goal of the trip for the nursing students was to immerse themselves in health care in the context of another culture, take what they've learned here and see how they can adapt it to meet the needs of a community using the services is has," Jones said. "It was absolutely a priceless experience." Jones and the six participating nursing students conducted health clinics and home visits in the villages of Lamonthe, Quicroif and Thomassin where they focused on basic wound care, women's health and distributed reading glasses after conducting rudimentary vision tests using a vision chart in French Creole, the official language of Haiti. "We used shards of a broken mirror to show them their reflection wearing the new glasses, and it was amazing," Jones said. "That was probably our favorite thing we did." "They were a tremendous help in providing support and educational games to the children of those seeking medical care," Jones said. "I kind of went into the trip with the mindset that I know everything I need to know to be a nurse right now, but in coming back I realized how much more I could do to be a better nurse," Morrell said. "I really saw who they are as nurses," Jones said. "I saw their hearts and passion." Drawing on her experience of keeping show rabbits, DeeAnna Berry, a junior studying animal science within SFA's Department of Agriculture, developed a comprehensive brochure on rabbit husbandry that was translated into French Creole and distributed to a group of women in the mountain-top village of Quicroif. "Being able to travel to different places to see how they care for their crops or their livestock versus how we do it in the U.S. is a real eye opener and can show us how to be more resourceful," Berry said. "The community was very welcoming and just wanted to help everyone." "They had built a good cage, but the limiting factor was the wire mesh for the sides," Laird said. "They used tin, the only thing they had accessible, and the cages were too hot." "While all study abroad trips are important, I think this trip's focus on service provides something different, and the students find more meaning in what they are doing," Laird said. "They were able to contribute to other's learning while also learning themselves." For more information on One Foot Raised, visit http://www.onefootraised.org/. To learn how you can be a part of the SFA summer course, contact Laird at lairdsg@sfasu.edu or (936) 468-2014.